Protesters defyied an eviction notice from BC Hydro as the Crown utility pressed ahead with land clearing around the Site C hydroelectric project along the Peace River in northeastern British Columbia. Photo by HO Verena Hoffmann/The Canadian Press. 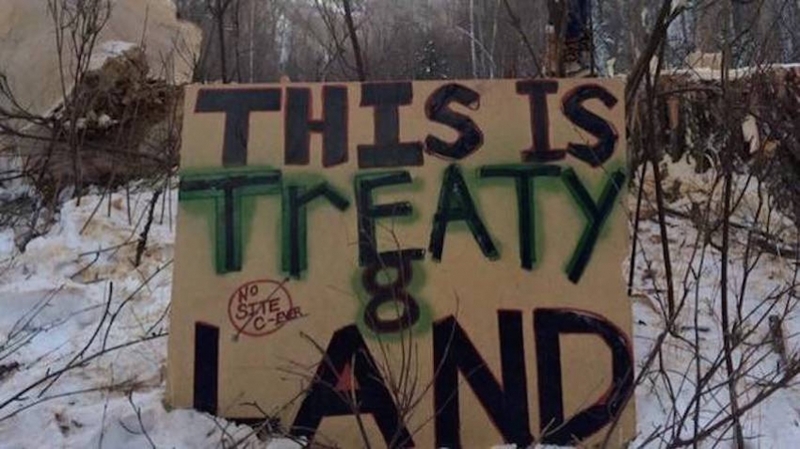 The Union of BC Indian Chiefs (UBCIC) calls for an immediate halt to the forced evictions of the Boon and Meek/Jardine families on Treaty 8 territory and to suspend any new contracts, and cease the construction of the Site C Dam project threatening the Treaty 8 First Nations, the families, and the communities of the Peace Valley. Confronted with an allied BC Green Party and BC New Democratic Party, Premier Clark’s Liberal government faces an evermore uncertain future. An NDP government supported by the Greens represents an end to the era of unfettered development and destruction throughout First Nations lands and territories. Extending the residential leases for the Boon and Meek/Jardine families by one month beyond May 31, 2017, is not sufficient. With the future of the Site C Dam in question, the eviction of families serves no useful purpose and is both premature and irresponsible. BC Hydro must suspend Site C’s planned schedule to prevent irreversible harm to the families and the environment. It is no longer business as usual in B.C., and the government-in-waiting holds no mandate to pursue Site C. John Horgan has committed a BC NDP government to submit the Site C Dam project to a necessary, and previously overlooked, review by the BC Utilities Commission (BCUC). In considering the economic impacts of this project, the UBCIC agrees the BCUC should review and consult on the development of Site C, while acknowledging the impact of this project on the land-based traditional economies of Indigenous peoples. A BC NDP government will welcome and adopt the United Nations Declaration on the Rights of Indigenous Peoples which reaffirms Indigenous peoples’ inherent rights to their lands, territories, and resources as well as their spiritual relationship with their traditionally owned lands, territories, and waters. Proceeding with construction of the Site C Dam runs roughshod over many of these rights. This project will have a devastating impact in the Treaty and Aboriginal Rights of Treaty 8 First Nations. The project will eliminate the Treaty 8 First Nation communities’ ability to continue their way of life and exercise their Treaty-protected constitutional rights to hunt, fish, trap, harvest and carry out their practices on their land. Devastating and irreparable harm to multi-generational farming families and First Nations title and rights, including the destruction of numerous sacred and traditional use sites, must be avoided by ensuring that Site C’s planned schedule is suspended. Irresponsibly rushing the development of the Site C Dam ahead of the BC Utilities Commission review is a reckless and negligent use of tax dollars. As per Resolution 2015-14, the UBCIC unequivocally supports Treaty 8 tribal leadership in their opposition to the proposed Site C Dam project and their assessment that the proposed project is a threat to their ability to exercise their constitutionally-protected Treaty rights, and to the survival of their culture and People. The UBCIC calls for the immediate suspension of construction of the Site C Dam pending completion of a review by the BCUC.